If you're into mandatory joy and kitschy decor, you're probably a Chili's fan. While many millions of Americans fall into this category, no one loves the casual, Tex-Mex chain quite like its "Super-Trainers," an elite team that travels the country, turning flair-wearing servers into servers who wear flair... with flair. As a tribute to these brave souls (and probably a chance to ridicule them a bit), NBC has started developing a series based on their unique career, according to a report by Deadline. The untitled ensemble comedy will be written by Sean Gray, a former co-executive producer of Veep. That's strong evidence that this show will be hilarious, but don't expect Veep's vulgarity: It's about a family restaurant on a family network, after all. Condé Nast Entertainment, Sony Pictures TV Studios, and Olive Bridge Entertainment will all be producing. "The super-trainers school [new employees] in techniques, in standards, but most essentially in spirit," according to the GQ article that inspired the TV show. "These super-trainers are the SEALs of the Fresh Mex fast-casual game, and they are also its sages." 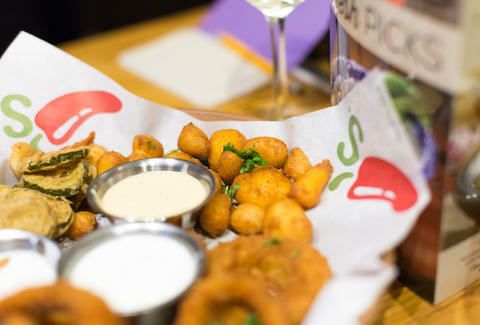 That article's called "Inside the Church of Chili's," and it's a hilarious read that'll also give you some hints as to what the show might consist of. Keep in mind that, for obvious legal reasons, the restaurant will probably be a national institution of casual dining with flair, spirit to spare, and hyper-devoted servers that goes by a slightly different name (Chile's with an E?). It's hard to believe it'll be stranger than the true story though, where they call the kitchen the "Heart of the House," and people saying things like, "I don't like seafood and I don't eat fish, but I love Chili's salmon." James Chrisman is a News Writer at Thrillist who only watches antique flip books. Send news tips to news@thrillist.com and follow him on Twitter @james_chrisman2.